The other day, I was reading Celia’s post, One Giant Tromboncino, where she mentioned she had made a chocolate zucchini cake with some of the tromboncino. It reminded me of the chocolate zucchini cake I used to make. I have a tendency to overcook cakes. I am sure it is because I don’t make them often and, therefore, have never worked out just the right moment to take them out of the oven. I have been advised to take them out just before they are perfect because they continue cooking… but when is that? I don’t usually make cakes because, if you make them, you eat them and I am fat enough but my friend, Sandra, was coming around the other evening and Sandra likes all things sweet so, with the cake on my mind, I decided to make it. It was lovely and moist, notwithstanding my overcooking tendency. I am sure it is the zucchini that keeps it moist. If you are like me and never come up with a lovely, moist, perfectly-cooked cake, give this one a go. It works for me every time. There is no hint of zucchini: it is just a rich and luscious chocolate cake. The recipe calls for orange icing. 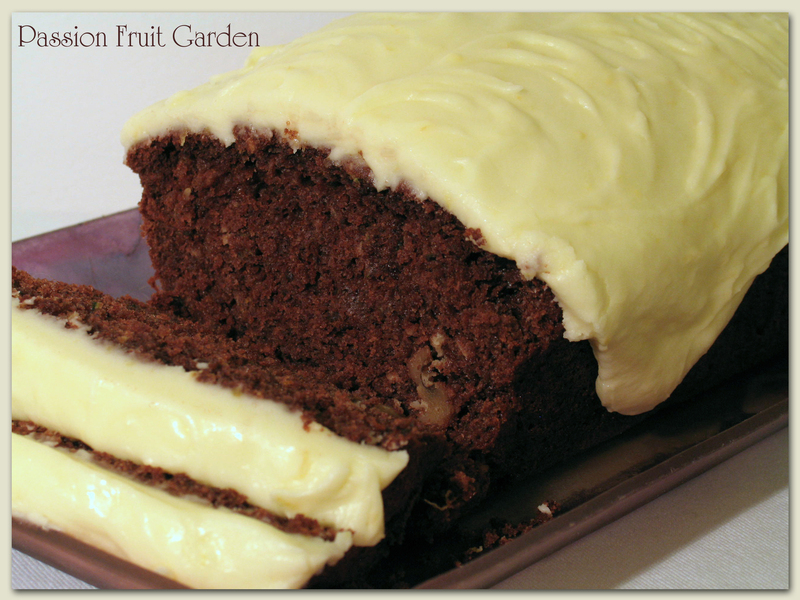 I am sure it would taste just as nice, or even better, with the cream cheese icing commonly used on carrot cakes. I found the recipe in an old Australian Women’s Weekly publication, Quick & Easy Family Meals. I just read on the web that it is also in the Australian Women’s Weekly’s Cakes and Slices Cookbook which is readily available. Butter a 15cm x 25cm loaf tin, line it with baking paper and then butter the baking paper. Cream the butter, zest and sugar in a small bowl until light and fluffy. Sift together the flour, cocoa and cinnamon. Stir in the sifted dry ingredients and the milk, zucchini and pecans/walnuts. Transfer dough into the prepared tin. Stand for three minutes before turning on to a wire rack to cool. Spread cold cake with orange icing. Beat butter and rind in a small bowl until smooth. Gradually beat in sifted icing sugar and juice. This entry was posted in Cakes, Eating your bounty, Sweet Things, Zucchinis and tagged Cocolate Zucchini Cake, Zucchini cake by Glenda. Bookmark the permalink. Happy birthday to the little gourmet, she will love this one, especially all that icing. This looks very good, Glenda, really moist. I love that you chose to frost it, too, especially being it’s orange-flavored. That touch of citrus would be great. Roz, thanks for this. I will copy it to my blog as it is really useful. What I usually do is test the cake with a skewer when it is still raw and then put it on for 10 more minutes because I am too scared to keep opening the oven and test it again and it is dry. With this cake it said ‘Bake in a moderate oven for about 45 minutes.’ Because it was in a hot fan forced oven I put it on 170C. I tested after 40 minutes -raw. Then after 45 minutes – raw then after another 10 minutes cooked a little too long!!! Any suggestions? Yeah, I thought the queen of cake making (and chocolate tempering) may be interested 😀 I really like cakes with vegetables in them, be it zucchini, pumpkin, beetroot or carrot, because I am sure the vegetable does keep the cake moist. Where does that vegetable go? Ooo, delicious! I will have to buy some zucchinis this week and turn your beautiful cake into cupcakes. Cupcakes ooh!! How long would you cook them for?